How to get there: This mountain is located about 150 km west of Alice Springs in the middle of Australia. The political area is called the Northern Territory, a referendum to become the 7th. state of Australia was not approved. Drive west on the Larapinta Hwy. After 47 km, do not continue towards Hermannsburg, but turn (sharply) right and continue another 93 km to Glen Helen. At this point the paved road ends, continue another 20 km along the dirt road and locate a road going right with a sign to Redbank Gorge. This road is another 5 km, slightly more rough, but (in the dry season) normal cars can still make it there with careful driving (there was at least one "standard" car at the trailhead). 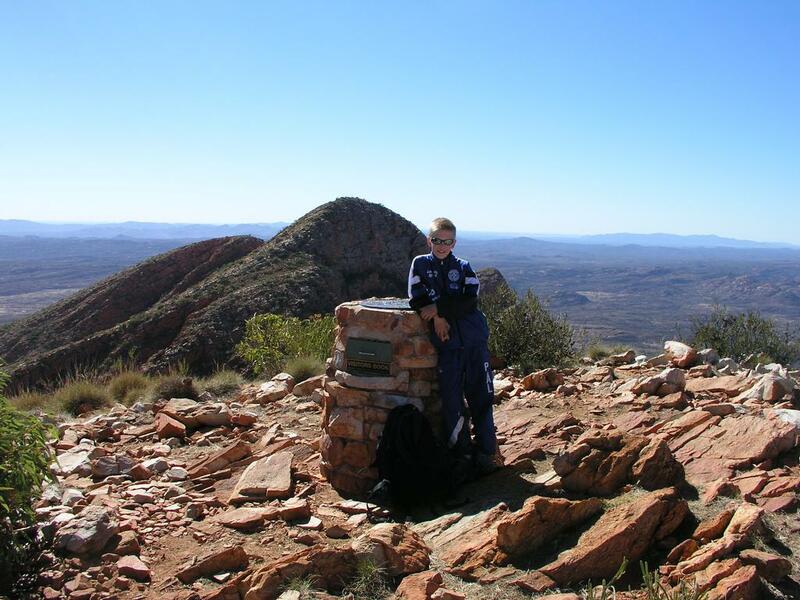 Route description: The long version of this hike starts at the old telegraph station that subsequently gave the name Alice Springs to the town. It follows the West MacDonnell Ranges westward for 215 kilometer to the trailhead described above. From here, the developed trail continues about 4 more kilometer towards the summit of Mount Sonder, however, a slightly less well marked trail continues another 4 km to the south-west summit (which is NOT the summit!). 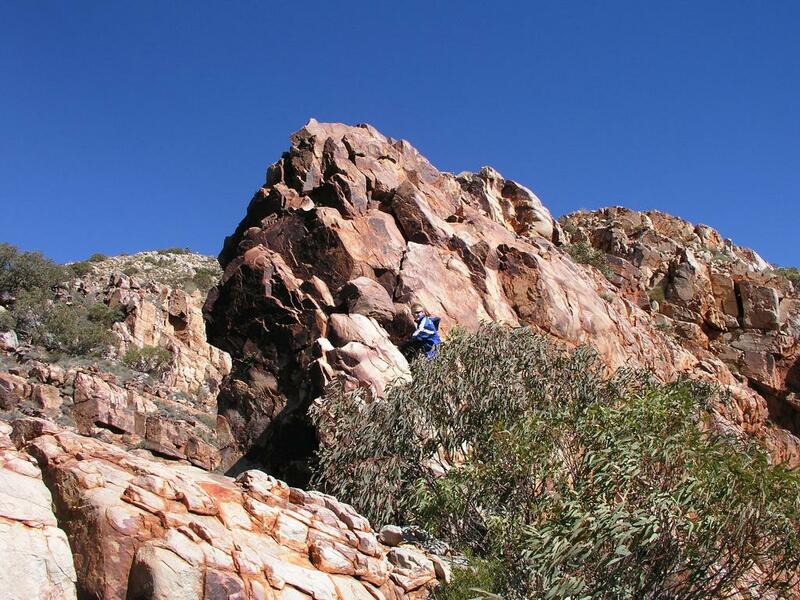 This trail is called the Larapinta Trail and has been developed in the recent years (late 90's and 2000/2001). From the trailhead described initially, there are two trails, one (the one forking left) heads directly to the very fascinating Redbank Gorge, while the other (straight ahead, forking right), a much wider path (almost a narrow road) takes you more directly down to the riverbed. It is important to take the wider path if you want to climb Mount Sonder first. A side trip to the gorge is highly recommended, but perhaps after the climb for a chilly dip in the water. As you get down to the river (almost certainly dry), there are wooden signs, straight across towards the mountain, sharply left if you want to go to the gorge. Cross the riverbed and continue along the trail for a few hundred meter to a new trail intersection with clear, wooden signs. Straight ahead takes you on the Larapinta Trail in the direction of Alice Springs (215 kilometer), the trail going left is the direction of Mount Sonder. Continue along this trail as it climbs the hill in front of you and gains the ridge after about 2.3 km. From this saddle you have a nice view both north and south. The trail continues east up a gentle hill and at about 3 km (from the trailhead) there is a large metal sign declaring that this is the end (at kilometer 218) of the Mont Sonder lookout walk. The sign also points to mountains one can see and gives their respective heights as well as some information about a large crater formed by comet impact some 130 million years ago. 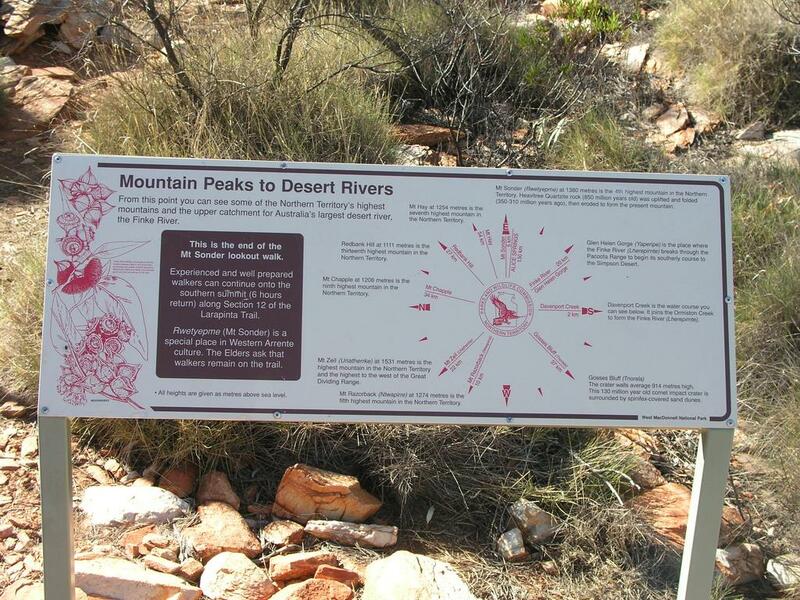 The sign further says that experienced hikers may continue to Mount Sonder, on what is the last part (section 12) of the Larapinta trail. The trail now follows the ridge with gentle slope and only one place with a noticable loss of elevation. 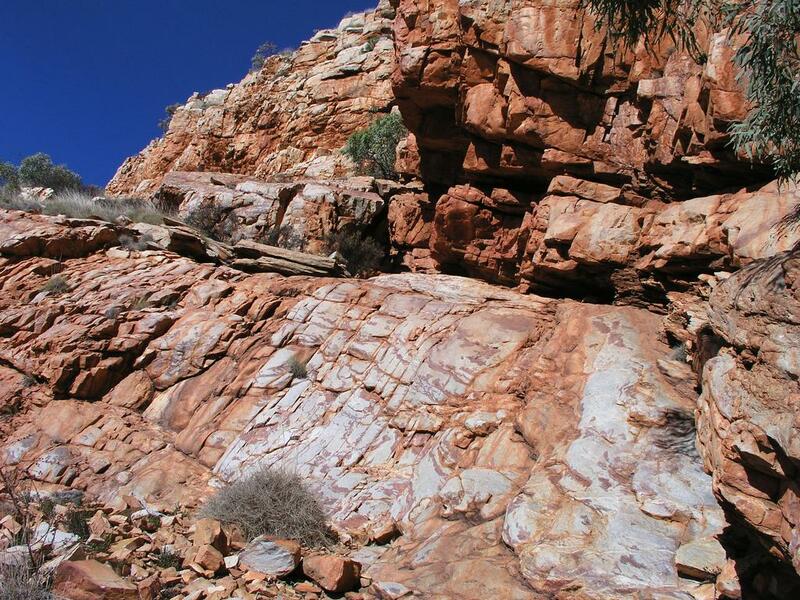 The trail has markers every kilometer, and generally runs on flat rock between spinifex. One can easily get a few meters off-trail here and there, but this causes no problem and one quickly merges back on the main trail guided by the avoidance of spinifex. 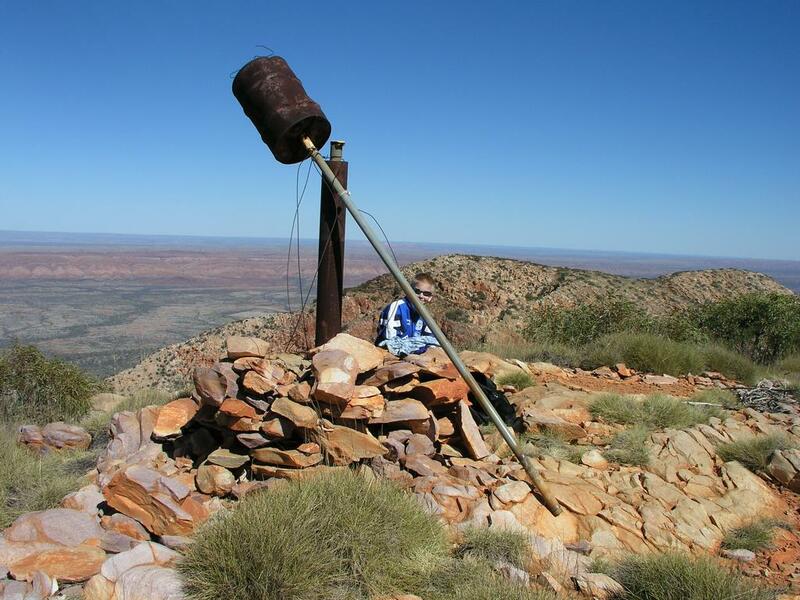 The trail ends at a summit with a nice cairn with an official Australian metal emblem on top, in fact an emblem of exactly the same type as one finds on top of Uluru (Ayers Rock). 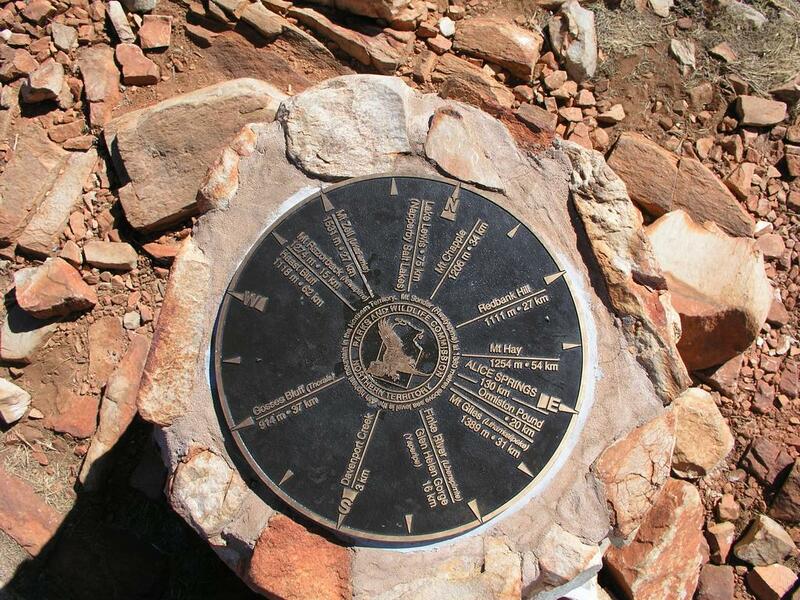 This metal plaque declares the summit of Mount Sonder, states the official elevation as 1380 meters and additionally, gives directional information to other peaks that are visible. There is also a very fancy "drawer" in the cairn that contains an official visitor log book. This is all very well except for ONE INCREDIBLE omission; not far away there is a peak that does look higher. In fact, this peak is only 750 meters away from the cairn. Already along the trail, we assumed that this peak was indeed the highest and where our trail would take us. GPS measurements gave an elevation of only 1360 meters, coordinates South 23:34.837, East 132:34.782. Consequently, we continued our hike towards this north east summit. 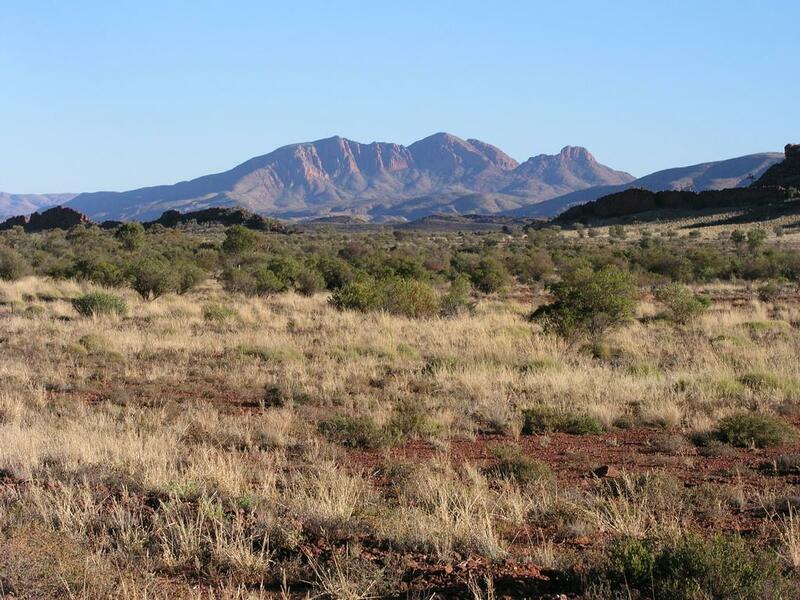 There is no trail, more spinifex and a ridge leading down towards the saddle and middle section between the two summits. Until now, this hike has been (YDS) class 1 all the way. The hike down along the connecting ridge quickly becomes somewhat more advanced. An incredible V-shaped ravine opens up on the east side of the ridge as the ridge itself quickly becomes more narrow and exposed. Continue down (this is class 3 terrain) with care as the top ridge narrows to only one meter and steepens just beyond a distinct tree that partly blocks the way. As you again reach more comfortable ground (a more level and wider section of the ridge) make a sharp left (marked by us with small cairns) if you want to keep the difficulty level at (YDS) class 3. The alternative option is to continue along the top ridge, this ridge drops abruptly at the end. Most people would prefer to rappel here, to climb back up is exposed (YDS) class 4 terrain. Assuming that one makes the sharp left turn, leaving the ridge, descend while staying close to the cliff on your left side. There are a couple of more cairns as the route gets slightly steeper on dry, excellent friction rock. The easiest (and safest) route is to climb as far left as possible, one can find handholds in the rock on the left while walking down a small ramp to easier terrain. There is no exposure along this section. Once below the steep part of the ridge, it is likely best to more or less follow the steep wall and climb back to the ridge. 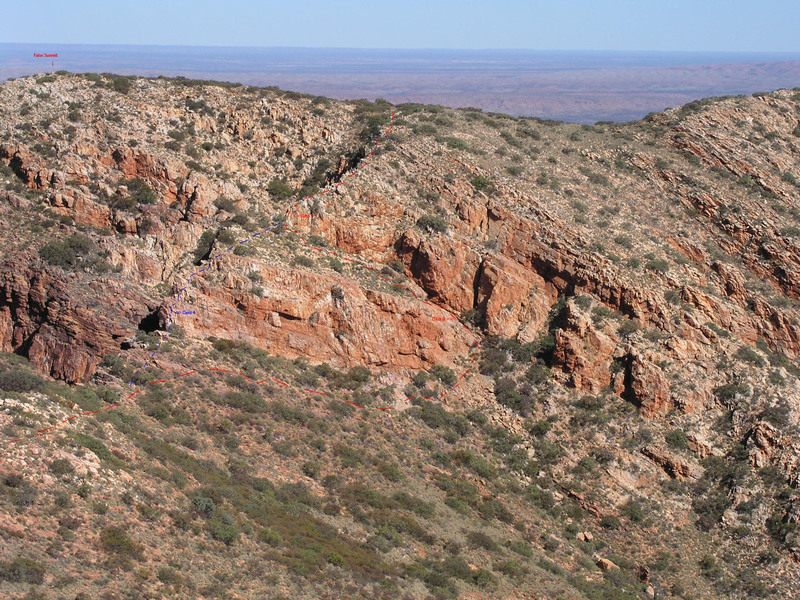 One can also take a line more directly across to the lowest saddle at the base of the Mount Sonder summit, however this will cross through more spinifex. The saddle between the two summits was measured to 1270 meter with GPS coordinates South 23:34.657, East 132:34.990. Thus, the SW summit may (or may not) have a 100 meter primary factor, given that the GPS elevation measurements each have an uncertainty of at least 5 meter. From this saddle, the climb to the north-east summit is straightforward. As suspected, this summit measured in at 1380 meter and is indeed the true summit of Mount Sonder. One should follow the same route on return. Comments: I did this climb with my son Pål Jørgen, age 14. It took us slightly less than 2 hours from the trailhead to the SW (false) summit. Traversing to the true summit required about 30 minutes, partly because we carefully explored the possible routes across. We had lunch at the summit and took numerous pictures of the surronding land. The return hike from the SW summit took about 1.5 hours. The trailhead information indicates that the hiking time to the SW summit and return should be 8 hours. After returning, one should definitely take the time to hike into the Redbank river gorge. This gorge is spectacularly narrow with bright red colors in the rock. The elevation at the base of the gorge is 860 meter, since there are also gorges between Mount Sonder and Mount Giles, this elevation is used to define the primary factor until better maps become available. The information available to people (like me) who are short term visitors is rather limited and a bit confusing. Trails are normally described without a map, the length of hikes are often given in hours instead of in kilometers etc. These estimates are often three times longer than what a normally fit hiker would need. The place to find maps etc. are with the Department of Lands Planning and Environment, located on the second floor of the shopping mall that is part of the pedstrian mall in Alice Springs. It turned out (July 2003) that the best map covering the MacDonnell Ranges is only in scale 1:250.000 with 50 meter contours. However, there does exist some black and white scale 1:100.000 (approximately) paper copies with 20 meter contour lines that covers the Larapinta hiking trail. Better than the 1:250.000 map, this still falls far short of being a proper quality map. 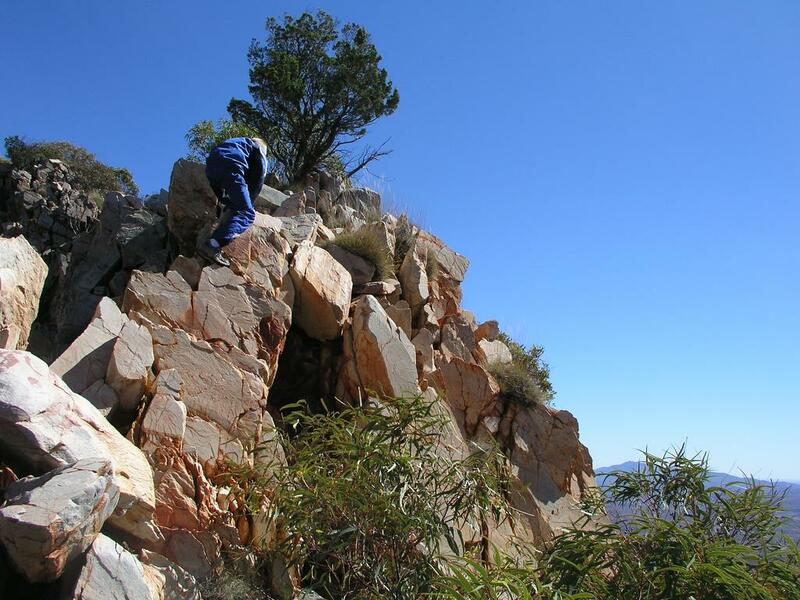 The Parks and Wildlife Commission should be given credit for developing the Larapinta trail. However, it is a shame to have such a fine trail end, essentially in a fraud. It is rather incredible that they can place an official marker stating the elevation 1380m on a "false summit" that only is 1360 meter, leaving the true summit with no comments at all. 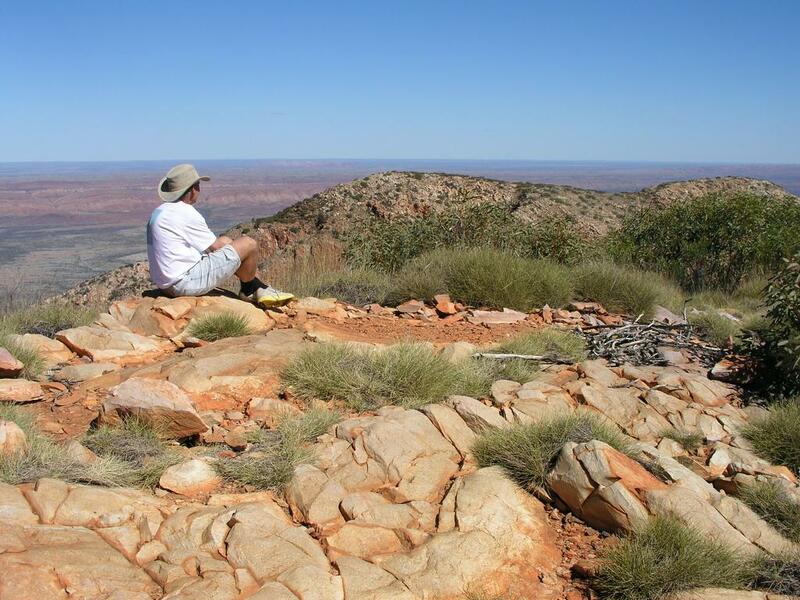 In my opinion, the only appropriate end would be to make the Larapinta trail end at Mount Zeil. At 1531 meter, this mountain is the highest west of the Great Divide, and thereby also the highest in the Northern Territory. The fact that this summit is only about 20 km away and that the Larapinta trail has covered more than 200 km at this point, makes any other endpoint seem inappropriate. One would still have the nice adjoining trail to Mount Sonder, this trail should obviously continue to the true summit. In particular, the summit cairn should be moved as soon as possible to the correct summit. Mount Sonder seen from the east in morning light. The SW summit is the high point to the left of the summit. On the true Mount Sonder summit, a very impressive view. Pål Jørgen on Mount Sonder. View from the Mount Sonder. Mount Razorback on the left, Mount Ziel further right. View east and south. Mount Giles is at the leftmost edge. The sign about 4 km from the trailhead. The route to Mount Sonder. This picture shows the route down from the SW summit leading to Mount Sonder. There are no difficulties or route finding problems on the part of the route that is outside this picture. A (longer) route that is only class 2 is possible if one goes further to the right (as seen on this picture) and accepts a bit more loss of elevation (1.3 Mb file). Pål Jørgen, climbing the ridge on return from Mount Sonder. This is class 3 with significant exposure on the left side. The second class 3 section on the connecting route. Gentle down from left to right on the ramp, then a bit narrow and somewhat steeper staying to the right as seen on this picture. Pål Jørgen, exploring the class 4 section of the ridge connecting the SW (false) summit with the Sonder summit. This is the crux of the route, however, as explained one can avoid this section. Pål Jørgen on the SW (false, 1360m) summit of Mount Sonder. Mount Sonder (1380m) is behind. The "official" summit, this marker is placed by the Parks and Wildlife Commission on the WRONG ! summit. The plaque, clearly states that this is Mount Sonder, elevation 1380 meter, which is all FALSE. This is the SW summit, elevation 1360 meter.